Ellin Goetz holds the philosophy that good design matters, and the work of her firm gives clear evidence of that intent. The firm was formed in 2001 after Ms. Goetz had been working as a registered landscape architect in Florida since 1986. The $25 million Naples Botanic Gardens, the historic Edison & Ford Winter Estates and the Norris Gardens at Historic Palm Cottage reflect her firm’s distinctive style, acknowledging powerful aspects of the unique Florida environment. She taps into the history of place on Fifth Avenue South, reviving a 1950’s tradition of flowering street trees reintroduced in the 1995 streetscape revitalization plans for Naples’ premier downtown. A series of neighborhood parks in the Mediterra community explore themes of astrology, time, meditation, the senses and Florida Calusa culture as never before seen in Southwest Florida. 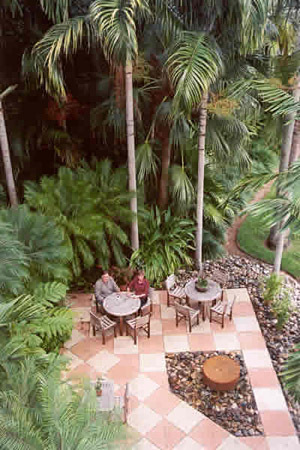 GOETZ+STROPES were principal landscape architects for the Naples Botanical Garden which opened to the public on 160 acres in November 2009. She received an Award of Excellence from the Florida American Society of Landscape Architects for her site design which included The Florida Gardens, Enabling, Meditation and Idea Gardens, Children’s Garden and Water Garden. Her innovative design of a sustainable network of parking bioswales, rain gardens and River of Grass garnered the Intelligent Use of Water Leadership Award. The Garden delights over a quarter million visitors annually. Her restoration of Mina Edison’s 1927 Moonlight Garden contributed to the Edison & Ford Winter Estates receiving an Award for Outstanding Achievement from the Florida Trust for Historic Preservation. Ellin is a Fellow, the most prestigious honor of the American Society of Landscape Architects and her service on environmental issues has been recognized with several community awards including Citizen of the Year. She currently serves as Vice Chair of The Everglades Foundation, and she was instrumental in establishing the Conservation Collier natural lands acquisition program and The Gordon River Greenway. Recent work includes the expansion of facilities at The Naples Zoo, a golf course revitalization with Jack Nicklaus at The Naples Beach Hotel & Golf Club, the Immokalee Youth Development Center, and median landscape renovations in Pelican Bay and Bonita Bay. Her firm is always active with various community association landscape improvement projects and many fine residential homes throughout Southwest Florida.